With summer approaching and the Fourth of July right around the corner, you might be sweeping the leaves off the ol’ BBQ and wire-brushing the grill. Well, we don’t want to rain on your charcoal, but have you ever considered the environmental impact of barbecuing? It can be significant. 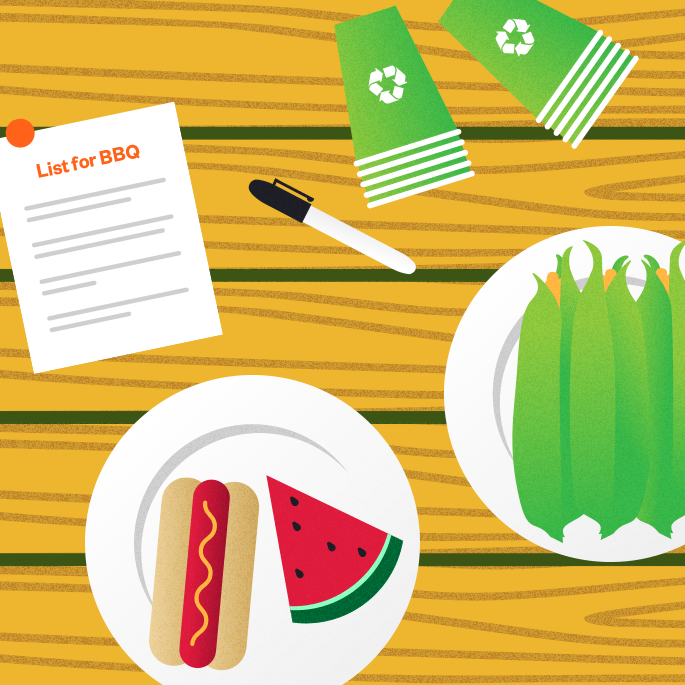 On July 4 alone, Americans will fire up 60 million barbecues, and those grills will emit 225,000 metric tons of CO2 into the atmosphere. Then, there are all the plastic plates, cups and utensils that will be used and all the factory-farmed meats that will be eaten. But don’t cancel your cookout just yet! You can have your Boca Burger and eat it too. Here are 5 steps to a smaller barbecue footprint. Inviting guests? You can avoid food waste if you figure out exactly what they’ll be bringing and precisely what dishes you need to supply. Then, make a detailed list and stick to it when you shop. If you do have leftovers, send them home with your guests. For more tips on avoiding food waste, read our previous post. Choose food raised locally when you can. Less fuel has been used to transport it, and many small local farms are sustainable and pesticide-free. And, of course, choose a lot of vegetables. Veggies can be great on the grill, and they’re far less harmful to the environment than meat. Several years ago, New Scientist magazine reported that the production of four half-pound burgers produces more greenhouse gases than driving three hours while you leave all the lights on at home. If you do cook meat, go organic or grass-fed if you can. To find sustainable producers in your area, try the Eat Well Guide. Choose reusable plates, cups and utensils. If that’s not realistic, there are now more sustainable disposables like 100 percent recycled paper plates or organic bamboo tableware. Check out Bambu, which has all sorts of sustainable bamboo selections, or Bio & Chic, which has everything from sugarcane plates to cornstarch cutlery. If you do use plastic cups, make sure to provide cup markers so your guests won’t use more than one cup. When it comes to outdoor grilling, the two most popular fuel options, charcoal and gas, aren’t necessarily the most eco-friendly. But if you must use one over the other, gas is slightly better for the environment, you and your family’s health and the climate. A charcoal grill produces three times more greenhouse gases than a propane grill, and that’s not including the greenhouse gases emitted by the charcoal kilns where the briquettes are made. Gas is more efficient than charcoal. Around 90 percent of propane makes it out of the production process as usable fuel, while only 20 to 35 percent of the source wood winds up as a charcoal briquette. What about electric? It can be a good option if your power comes from green renewable sources, but if not, electric grills can emit the most carbon of all. If you must have that charcoal flavor on your grilled foods, look for natural or environmentally certified charcoal chunks. They’re more sustainable – and less distasteful. Conventional charcoal briquettes often contain nitrates, petroleum solvents and coal dust. Yum. Check out Royal Oak Star Grill Lump charcoal, which is from renewable oak, hickory, maple and walnut hardwoods with no chemicals or additives. Royal Oak annually converts hundreds of millions of pounds of lumber industry waste wood into the charcoal. If you do ’cue with charcoal, start your chunks with a chimney. It’s quick and easy. Never use self-igniting charcoal – those briquettes that light at the touch of a match. They’re soaked with paraffin, petroleum products and other accelerants. Also avoid lighter fluids. Most of them emit volatile organic compounds, which can have adverse effects on your health. Here’s to blue skies and greener BBQs this season.